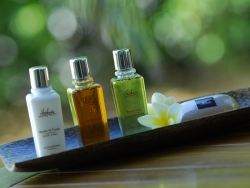 Nestled in a lush tropical garden of 3 hectares, the Iloha Seaview Hotel is a charming 3 star hotel that welcomes you to stay under the sign of authenticity and freedom. The Iloha is located on the hill of the village of St-Leu, in the west coast of the island, just 300 meters from the beach and its famous surf spot. Not far from the city center and its animations, the hotel is the ideal starting point for exploring the island of Reunion and its most delightful tourist attractions. Whether you are a couple on a romantic holiday or a family with children or even a group of friends, you will enjoy this charming hotel, where everything matches for your enjoyment and wellbeing in a sober, elegant and friendly atmosphere. 14 Standard rooms each with a surface area of 17m2. Located in the main building, 6 of them are situated on the ground floor and the other 8 are upstairs. All of them feature a furnished terrace and the bathrooms are equipped with shower, bathtub and separate toilets. 2 of these room categories are design to accommodate disabled. The Standard rooms can accommodate 2 adults. 16 Kitchenette rooms with a surface area of 37m2, located in a brand new one-storey structure featuring its own pool and an area design for peace and relaxation. 8 of the rooms are located upstairs with a panoramic view over the sea and the other 8 are located on the ground floor with a direct access to the pool. The kitchenette room categories are furnished differently with either 1 double bed and 1 single bed or 3 single beds or 2 double beds. 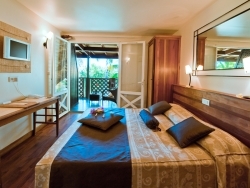 All features a bathroom with shower, separate toilets, a furnished kitchenette on the terrace and a private parking. 20 Kitchenette Bungalows, with a surface area of 32m2 each. All of them feature a furnished kitchenette on the terrace and are equipped with a bathroom with shower, sinks and separate toilets. 2 of these bungalows are design to accommodate disabled. 20 Tropic Bungalows with a surface area of 34m2 located in the heart of a lush garden. The rooms feature either twin beds or 1 double bed and an extra sofa bed. They are equipped with a furnished terrace and the bathrooms have a shower with separate toilets. 1 of the Bungalows is design to accommodate disabled. 10 Family Bungalows with a surface area of 55m2 each, located in the heart of a tropical garden. They all feature 3 bedrooms, including 2 separate double bedrooms, one with an en-suite bathroom and a loft bedroom with two single beds. 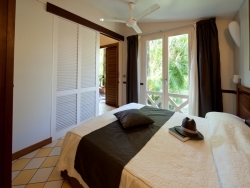 Besides the bathroom adjoining bedroom, the bungalow has another common bathroom with shower and separate toilets. 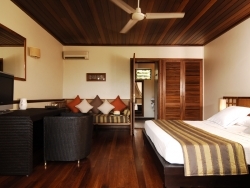 The Family Bungalow also features a fully equipped kitchen and a verandah. 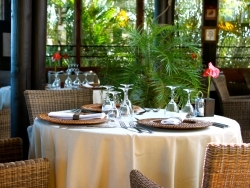 Located at the poolside in the shade of a vetiver hut, the main restaurant offers a cuisine, diverse and inventive base on traditional preparations with good Creole flavors. A special menu is also proposed for young children with flavors they are most used to. 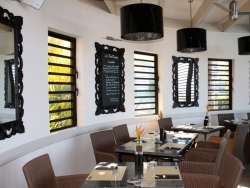 Located upstairs, the Italian restaurant, La Trattoria offers stunning views over the bay of St-Leu. It proposes a wide selection of pizzas, pastas, salads and ice cream and a snack menu is proposed in the afternoon. It is open daily from 02:00 pm to 06 pm and from 07:30 pm to 09:45 pm. 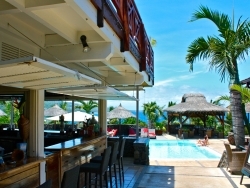 Located next to the pool, the bar is the perfect place to enjoy a cocktail made with Reunion’s rum, a fresh seasonal fruit juice or a snack.